Better Nickname: Nogueira. No contest. The Hybrid, what is that? Does Schaub run on electricity? Maybe he gets good gas milliage. Inside Scoop, Nogueira: He's 32-6-1 and he's starting to look old. There, I said it. And I hate myself for it. He recently lost to Mir and Velasquez by TKO and KO. Inside Scoop, Schaub: When Roy Nelson knocked him out I figured he'd never amount to much. But he's been good since then including a KO over the aged Mirko Crocop. Prediction: Schaub. As you get older, the chin is the first thing to go. Nogueira with a compromised chin is a narrow road to victory. 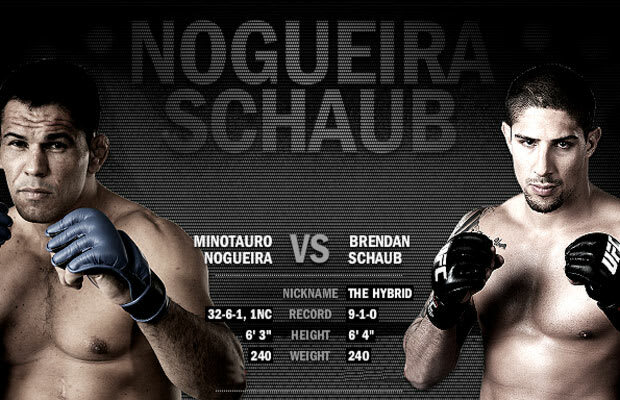 Schaub has been sharp-shooting lately and if he's smart he studied the Mir fight. Under no circumstances does he engage Nogueira on the ground, opting instead for stand up. KO.